Woolly’s Water Works is a licensed plumbing company lead by Paul ‘Woolly’ Woollett. 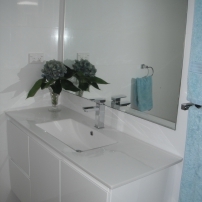 Our team of professional plumbers cover Sydney City, Eastern Suburbs, Northern Suburbs and Northern Beaches. Whether you have domestic or commercial plumbing needs. Woolly’s Water Works gets the job done! Call Paul the Plumber – 0412 444 892 today! Here are some images showing “before” and “after” renovation work completed by Woolly’s Water Works.